Sometimes the simplest cakes can taste the best. Basic and homely offerings that everyone without exception leaps to get a slice of. Top of this list has to be the classic Victoria Sponge and following in close pursuit is its close relation the Citrus Drizzle Cake. Drizzle cakes are a traditional British favourite and a cake you will find in most tea rooms over the country. They are it has to be said, perfect for afternoon tea. Now, you can of course jazz the proceedings up - triple layered sponge filled with lemon curd and topped with a cream cheese icing anyone? But equally it can be kept simple with just as impressive tasting results. I used orange and lemon juice in the icing as I'd both to hand but it would be good made with lemon and lime or just one fruit, but personally I think orange juice alone may be a little too sweet. 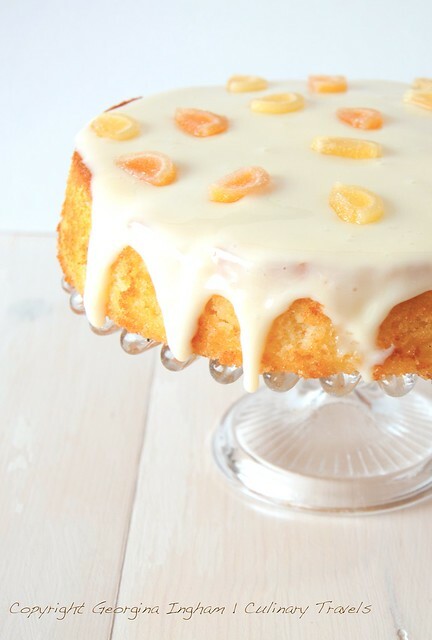 Who could resist moist buttery sponge topped with an incredibly easy to make tangy icing? I'm not talking the basic icing sugar and citrus juice here where you either turn the kitchen into a veritable snow storm with icing sugar clouds of mammoth proportions or battle to keep the icing lump free, as surely there's nothing worse than lumpy icing. 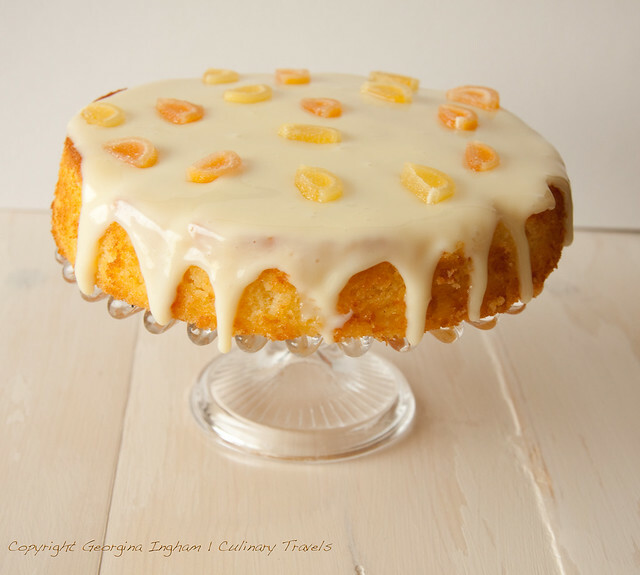 No, I'm talking about luscious, thick and creamy icing with zesty freshness and a mood enhancing citrus warmth, made with the magical ingredient that is condensed milk. And it really couldn't be easier! Take a tin of condensed milk and add citrus juice of your choosing, stir and allow to firm up a little before pouring over your chosen cake. Proportions here do not need to be exact, sure you just go by taste. 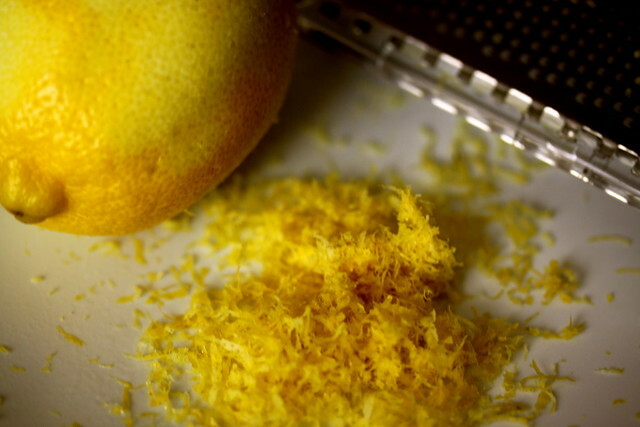 Top with a little lemon zest or as I did some cute little lemon/orange segment sweets. All in all, an exceptionally easy cake to make and very easy to eat too. Just be sure to have friends, family or work colleagues around to help you eat the goods as I am not taking the blame if you overindulge and eat the lot. 1. Preheat the oven to gas 180C or the equivalent. 2. Grease and flour or line x 2 cake tins (20cm round tins). 3. Cream the butter and sugar together until smooth. 4. Add the eggs, one at a time, and mix well after each one is added. 5. Fold in the sifted flour, half first, mix well and then the second half and mix well until combined. 6. 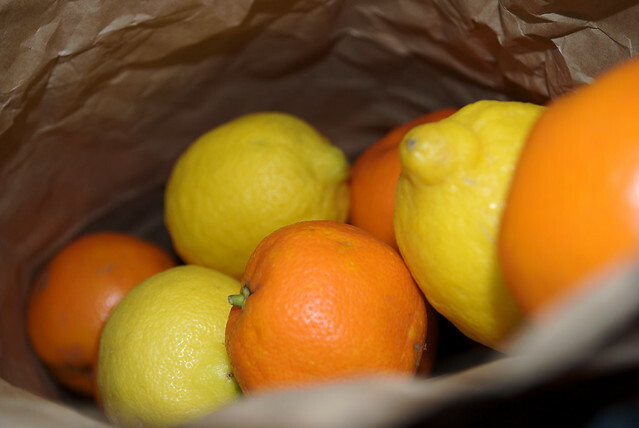 Add the lemon juice and orange juice and mix in. 7. Spoon into the greased/ lined cake tins 25-30 minutes or until a skewer comes out cleanly. 8. Allow to cool before icing. 9. Make the icing while the cake cools. 10. Pour the condensed milk into a bowl and stir in the citrus juice. 11. Leave to stand for a few minutes and allow to thicken so that it will just run over the sides of the cakes.